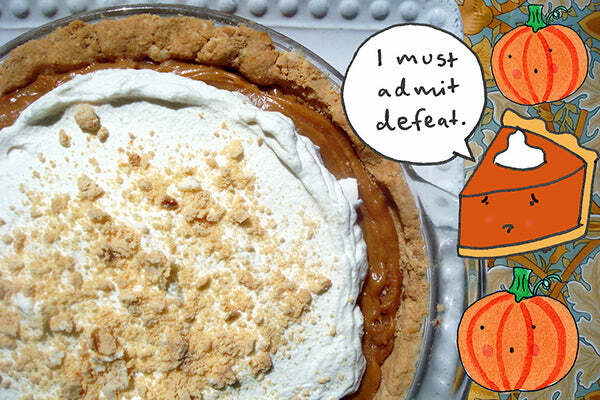 I try not to be prone to hyperbole, so please accept it as a matter of fact when I state that this Salted Caramel Peanut Butter Pie is the best pie ever. I mean it: it’s the stuff of “last meal” dreams–or at the very least, some very loving and lasting Thanksgiving memories. 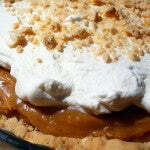 This pie has all of the components of crave-ability: a peanut butter cookie crust, a luxuriant peanut butter-infused salted caramel filling, a subtle yet perfect cloud of brown sugar whipped cream, and–why not–a few more crumbled cookies sprinkled on top as a tasty garnish. It has salty, it has sweet. 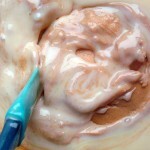 It has rich, it has creamy. It has peanut butter. 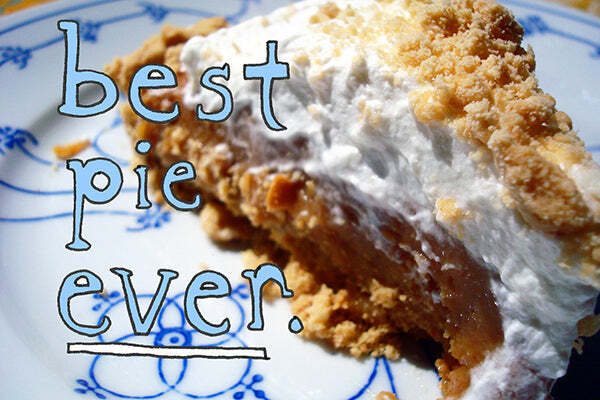 This is a pie that keeps you coming back for more, and you’ll love every last bite. 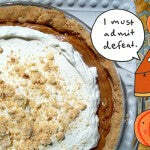 This is an indulgent pie, but I’m a big believer that we all deserve a treat every now and again. After all, if you are what you eat, why not be incredible and sweet? 1. Begin by making the crust. Preheat the oven to 350°F. 2. Lightly spray a pie plate with non-stick spray (or use butter to lightly grease the plate). This step will ensure easy removal of the pie once sliced. 3. In a large bowl, mix 2 1/2 cups cookie crumbs, melted butter, and salt. Gently press the mixture into the greased pie plate, making sure to press the mixture evenly into the bottom and up the sides of the pan. 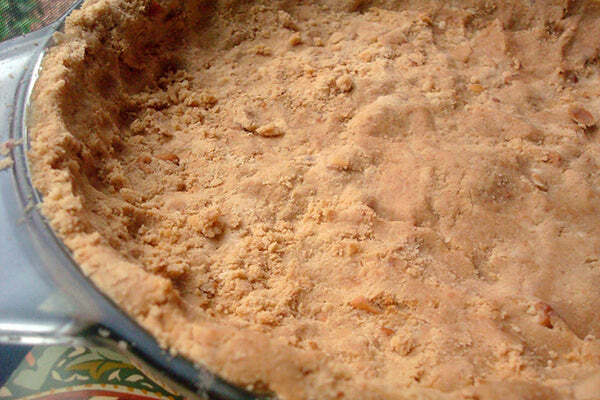 The amount of cookie crumbs will leave you with a nice, sturdy crust on all sides. 4. Place the pie plate in the preheated oven, and bake for 10 minutes, or until there is a slight matte look to the crust and it is fragrant and toasty-smelling. Remove from the oven and set to the side to cool completely. 5. Increase the oven heat to 425°F. Now, grab either a 9×9 or 9×13-inch baking plate. Have nearby your roasting pan or slightly larger pan, in which the smaller pan can comfortably fit with clearance on all sides. 6. 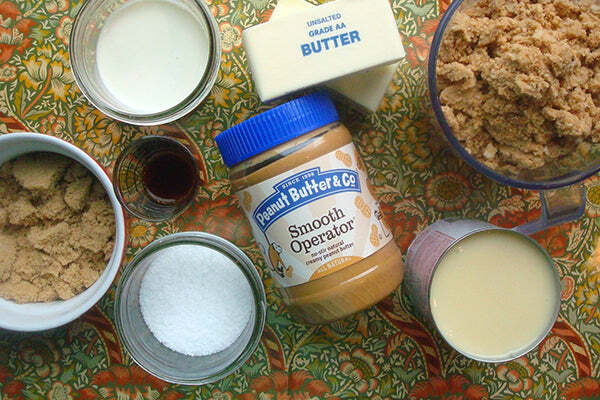 Pour the sweetened condensed milk in the pan, using a spatula to make sure you get everything out of the cans. 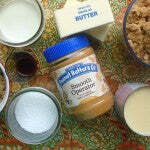 Add the brown sugar, peanut butter, vanilla extract, and salt. 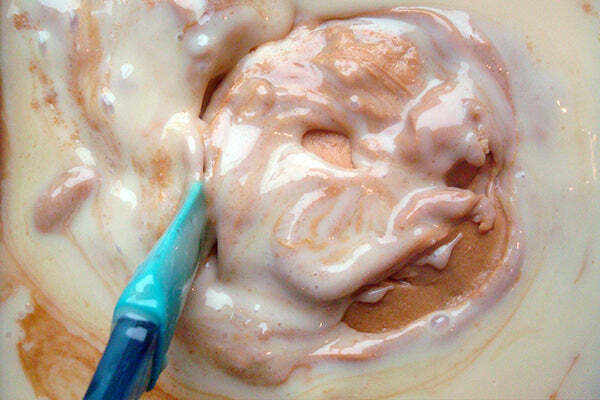 Give it a light mix to combine everything–it won’t come together in a smooth, creamy and cohesive mixture, but that is OK for now. Just give it a few stirs for even distribution. 7. Place the loaded baking pan in the larger vessel, and gently pour water in the larger vessel until it reaches about halfway up the smaller baking pan. Pour along the side so that none of the water gets into the sweetened condensed milk mixture (although it is not cataclysmic if a splash of water gets into the mixture). It’s better to do this with the smaller pan already in the larger pan, because you don’t have to worry about sloshing due to water displacement. 8. 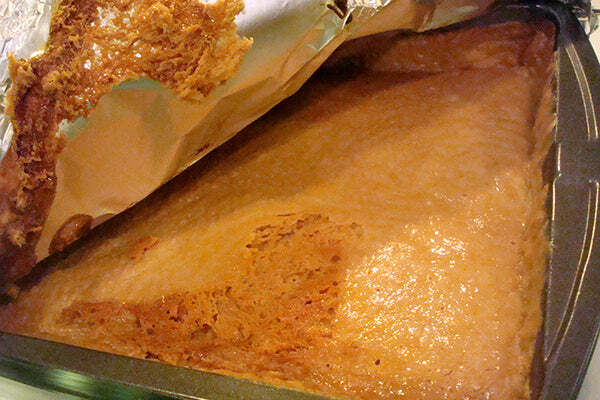 Place a sheet of foil on the top of the baking pan with the condensed milk mixture. Be sure to leave it somewhat loosely wrapped at least on one side, because you will have to lift it a few times during the baking process. 9. Gently, gently, so as to avoid sloshing water, place the whole cumbersome mass into the oven. 10. Now, you’re going to bake the mixture for two hours total, but you will have to be on guard, because you’ll be checking on the mixture twice. 11. 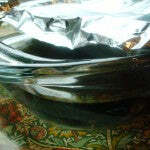 At 40 minutes, remove the mixture from the oven, lift the foil, and give the mixture a stir (you’ll see it starts to look more “mixed” at this point, although it may be somewhat bumpy). Check the water level and replenish if needed. Place the pans back in the oven. 12. 40 minutes later (this is 80 minutes into the baking process now), repeat the previous step. Place the pans back in the oven. 13. Once your 120 minutes have passed, turn the oven heat off, but leave the mixture in the oven for about 20 more minutes. Remove from the oven, and gently remove the pan of condensed milk. 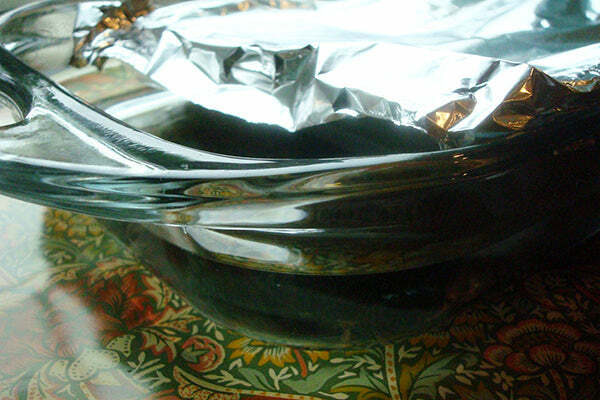 Place it on a heatproof surface, and gently stir the mixture. It may still have some bumps and lumps but it will dissipate as you mix, then further as the mixture cools. Let the mixture come to room temperature, stirring every so often if you’re moved to do so. 14. 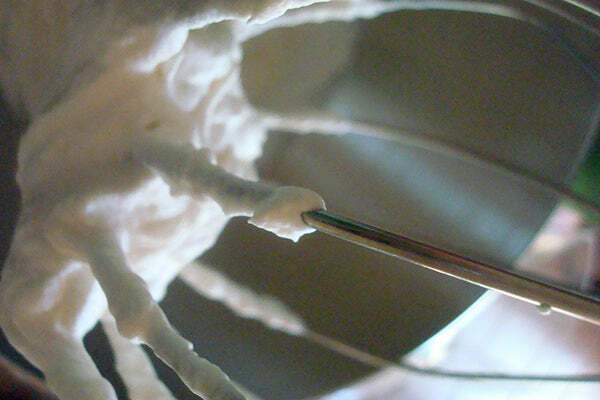 Once the mixture has cooled, gently spread it into the finished pie shell. 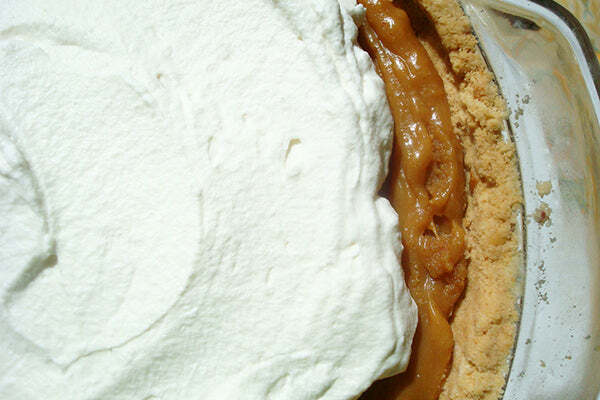 Be very careful, because the pie shell will be delicate and can easily be torn up if you spread the caramel mixture without extreme care. 15. 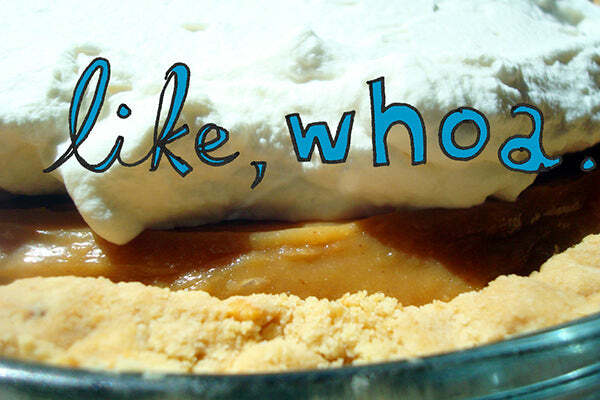 Now that your filling is in the pie, make the whipped cream. 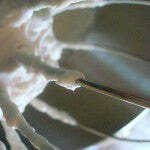 Place the whipping cream in a bowl, and whip using a hand or stand mixer fitted with whisk attachment until soft peaks form. 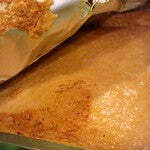 Add the brown sugar, and continue mixing until the mixture has firm peaks. 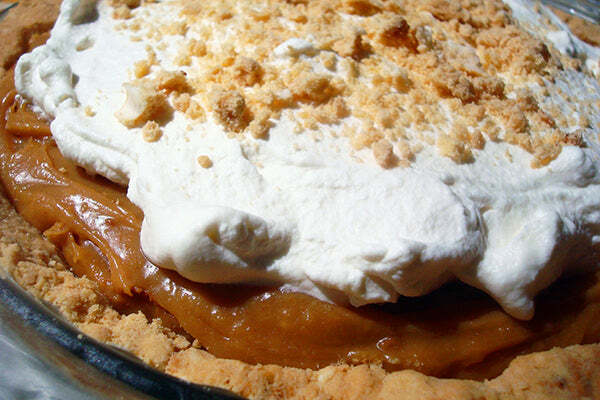 Spread on top of the finished pie, and garnish with the remaining cookie crumbs. 16. 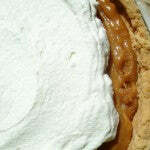 Refrigerate the pie until ready to serve. 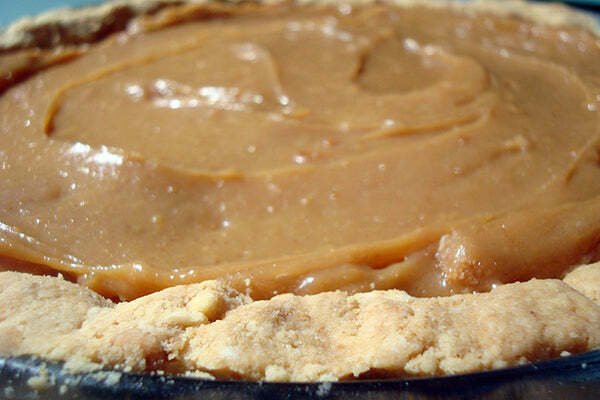 While the pie is eatable as of this minute, it will be sticky and a little messy when cut. 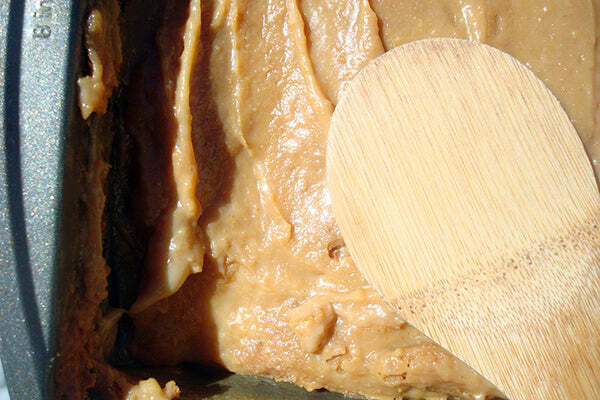 Refrigerating for an hour will ensure an easier texture for cutting and serving. 17. Store covered in the refrigerator for up to 3 days. ●	You can make the filling up to two days in advance. 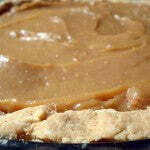 Simply store, covered, in the refrigerator, and let come to room temperature before spreading in the pie crust. 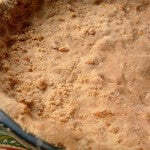 ●	The pie crust can be made up to several days in advanced. Bake the crust, let it cool to room temperature, and store in the refrigerator for up to 2 days, or the freezer for up to a week in advance. 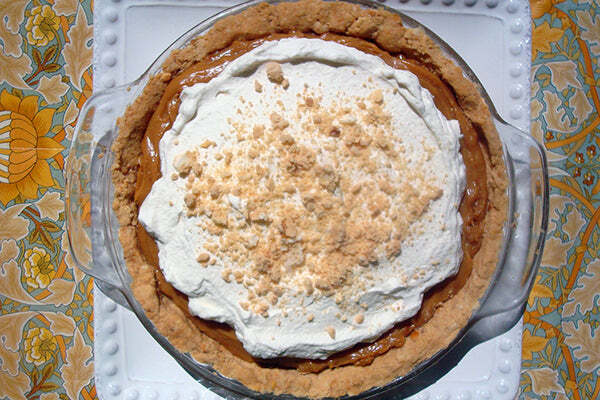 ●	While I used Smooth Operator peanut butter for this pie, if you love the combo of salted caramel and chocolate, you could swap Dark Chocolate Dreams in the same quantity. 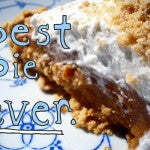 ●	I used peanut butter snowball cookies for the crust, but you can use any type of peanut butter cookie you like. 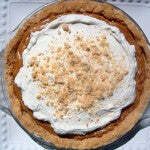 You can also use a more traditional butter pie crust if desired. 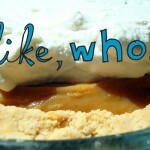 The post Salted Caramel Peanut Butter Pie appeared first on - Peanut Butter & Co. Recipe Blog.